Posted in: General Information. Tagged: Cleanup. On Saturday, April 11, 2015, six Prophets and one son of a Prophet did their civic duty by cleaing a stretch of Route 283, beginning at the Rheems exit and extending to the Snyder Road overpass – a bridge which always seemed a little too far away. The Prophets met for breakfast prior to the ordeal. With full bellies, they began working off their meals at 8:30 AM, trudging the two miles of highway (on each side) collecting trash. All told, the group filled 53 trash bags. This is trash that has accumulated since last September, when the Grotto last did a highway cleanup. Special finds include a womens pocketbook (which Pro. Shaffner is attempting to return to its owner), a half a dozen license plates, one dear caracass, lots of styrofoam, plenty of bottles and cans. 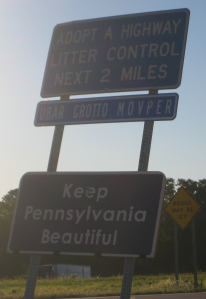 We estimate that, to date, Ubar Grotto has picked up more than 250 bags of trash along this section of 283 in the last three years! The highway cleanup is a thankless job, but we very much appreciate Pro. Abe Shaffner continuing to head this group. We’d also like to thank Prophets Allen Moyer, George Grove, Harry Smith, Seth Anthony, Tom Dice, and Pro. Dice’s son for assisting today. The Commonwealth is a little bit prettier because of these men.